The Romeo y Julieta No.1 Tubos is a creamy medium-bodied Crema, 5.5” (140mm) long, of 40 ring gauge, and comes in aluminum tubes in a 15 cigars box. The Romeo y Julieta No.1 Tubos is a smooth and rich medium Crema, 5’5” (140mm) long, of 40 ring gauge, and comes in aluminum tubes in a 25 cigars box. Therefore it stays in good condition even outside a humidor. So it is ready to be open at any occasion, and thanks to its amazing construction, it can be enjoyed from the beginning until the very end of it. There are no strong or intense flavors, just a pleasant mix of smooth flavors, wood, coffee, chocolate and some of leather and floral tones. Altogether they make this a cigar that will appeal to both the experienced smoker and the newcomer to Cuban stogies. Great go-to-cigar. Inexpensive for its quality. • Typical Romeo y Julieta smoothness and aromas. • Flavors of wood, coffee, cacao and leather. Just enough spice to it. A cigar that appeals to both connoisseurs and newcomers. You can buy just for its beautiful tube. The Romeo y Julieta No.1 stays fresh even outside of a humidor thanks to its beautiful revamped aluminum tube (white color with the brand name and logo in red). Taking it out from the tube the cigar, which is fully hand-made, one is struck by its beautiful construction. The wrapper is quite oily and smooth, with very few apparent veins and a nice colorado color. The cigar has a good weight when in hands, it seems very well rolled thanks to a generous filling. The cap is very well applied and the foot feels very well bunched. The squeeze test reveals just enough give in the cigar. After cutting the cap, the pre-light draw is just perfect, not too tight, and not too loose. The draw gives way to flavors of earth, herbs and also some flowery notes. There are also some hints of cacao and of coffee. 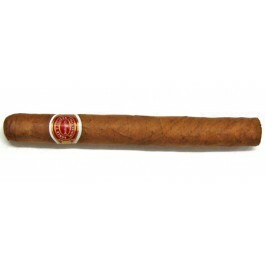 Once lit, the Romeo y Julieta No.1 releases a generous amount of smoke and the burn is great all throughout the cigar. The draw poses no problem whatsoever and the cigar creates a nice dark gray ash. The cigar starts off with some strong aromas of leather and deep earthy tones. At the same time, there is an abundant amount of spiciness of pepper in the background. As secondary flavors, we can also note some leather, some salty bitterness of wood and some nice floral aromas that bring some welcomed sweetness. The overall first third is relatively smooth but the smoke is full bodied. In the second third, the Romeo y Julieta No.1 continues on with the same flavor profile, where the aromas of wood are becoming more noticeable, as well as the earthy flavors. The overall taste is still great; there are also some more sweetness and less saltiness. The leather is fading in the background and some caramel taste is appearing. While the pepper is nowhere as powerful as in the first third, some herbal notes are coming into the foreground, as well as hints of coffee. The cigar is still very smooth, very creamy with just enough sweetness. In the final third, the flavors continue to be more or less the same as in the middle third. The cigar mellows a bit; it is now in the mild to medium range. Some bitterness arises towards the end of the smoke, but not hampering the overall amazing taste of the cigars. In summary, the Romeo y Julieta No.1 is a great medium bodied cigar. It is easy to smoke; it will please both the novice and the experimented smokers.